The art of wrapping the sword hilt is called tsukamaki. It requires enormous patience, persistence, and attention to details. In this art, the materials needed are glue, the cloth (ito), paper, and the tsuka (sword handle). There are several types of tsukamaki, and you can see examples of them below. 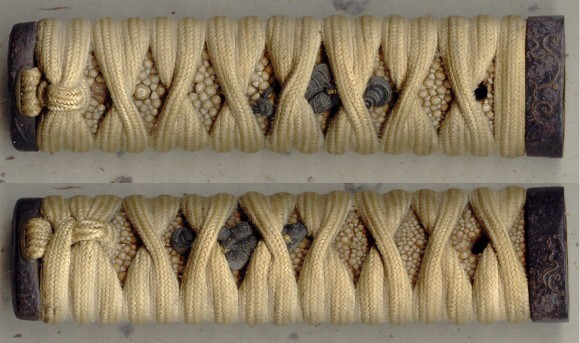 Hineri maki is a basic style where both strands of the ito are twisted and folded at the crossover. This example is from a cilivian mounted katana. The tsuka is 26 cm (10 1/4″) long. Tsumami maki is a fancy style where both strands of the ito are pinched at the crossover. This example has unusual ridges in a cream colored ito. This tsuka is on a shinto wakizashi signed gatsu. The tsuka is 14 cm (5 1/2″) long. Hira maki is an old tachi style where both strands of the ito remain flat at the crossover. This is from a katana mounted in handachi mounts. The tsuka is 27.5 cm (10 3/4″) long. Katate maki is is a battle style that starts and ends with hineri maki and has one strand wrapped around the middle of the tsuka. This is the style used on some older katana and tachi and also on 1944 pattern Shingunto. This is a tsuka from a katana mounted in 1944 pattern army mounts with lacquered ito. This tsuka is 24.5 cm (9 5/8″) long.